The sweetest time of year is only weeks away. Valentine’s Day has always been an eventful holiday for our family and if you’ve been around long enough then I am sure you know why. Seven years ago I received the most precious gift on this special day, my little girl! Of course, it was love at first sight and upon arrival I instantly fell in love with being a mother. Who wouldn’t? It’s a pretty darn amazing feeling and no amount of candy, cards, or flowers can compare. Since Valentine’s Day falls on a Sunday this year, Toodie’s class will be celebrating the Friday before. Each little human has been instructed to bring a homemade valentine box in and treats to trade with friends. I could easily run to the store and pick up a boring box of cards for her to hand out but let’s be realistic, that’s not how this crafty momma rolls. 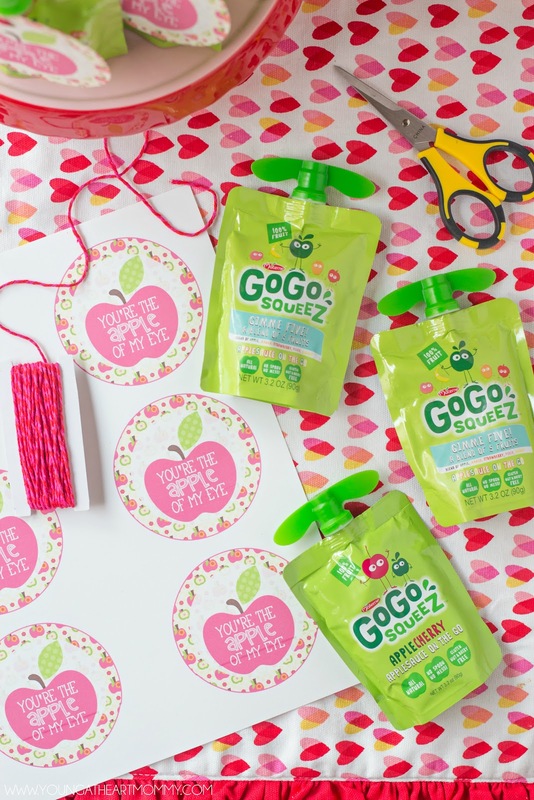 Instead, I have created an adorable printable to attach to these GoGo squeeZ applesauce pouches. The best part about these is that no candy is needed. Let’s be honest parents, we know our kids are going to be all sugared up anyways so why not give them a healthy treat to hand out? 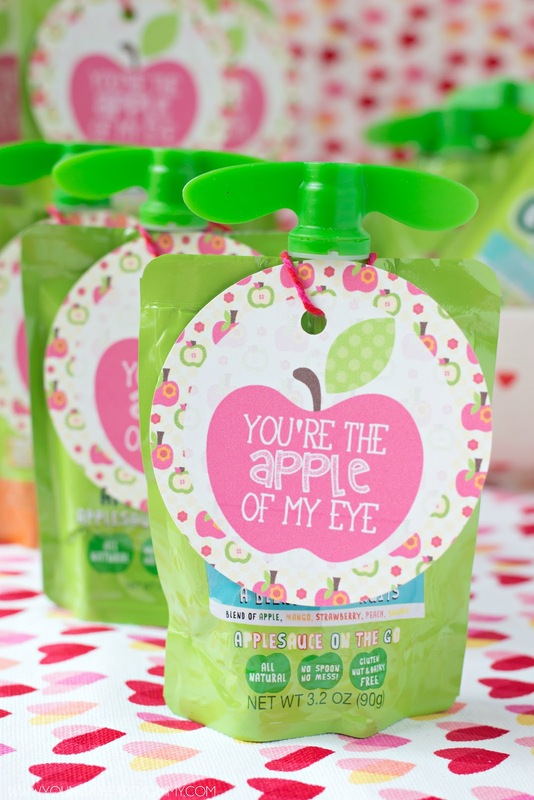 Kids love the fun squeezie pouches! 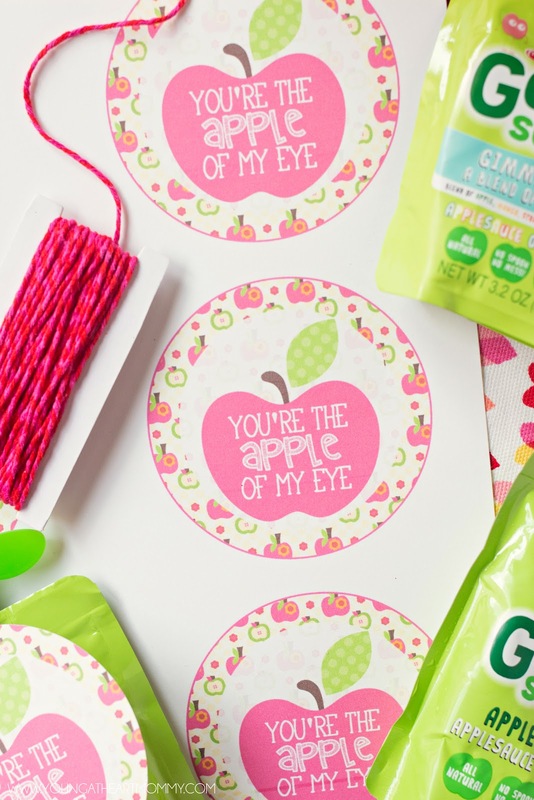 Once labels are printed you can use a pair of scissors or the large circle punch to cut them out. Punch a small hole on top and string through to create a tag for the pouches. TIP: If using the heavy duty card stock paper to print these labels, make sure to only put one sheet in at a time. If not, it could lead to poor printing quality or imperfections due to the paper tugging. You can see this in the last row of my sheet of labels as the lettering is not complete. I found the best results are achieved this way and it will prevent you from wasting paper! 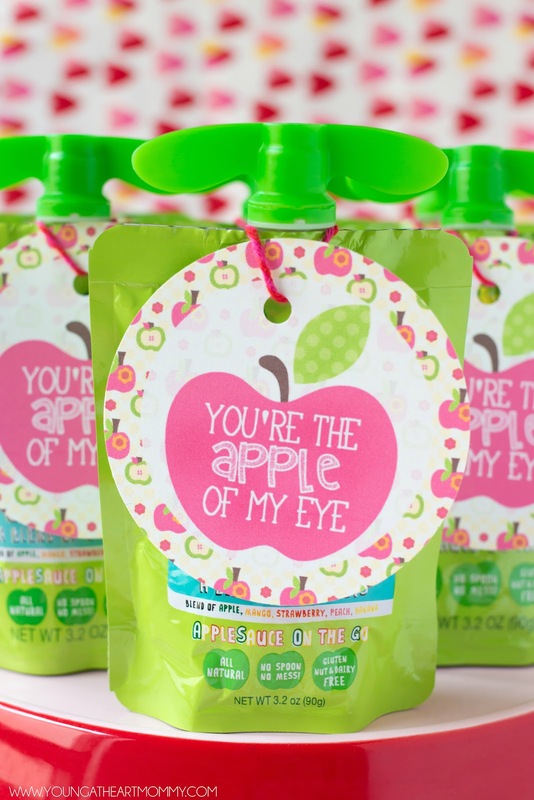 What kind of non-candy goodies do your kids like to hand out for Valentine’s Day?